This book presents the reflections of a group of researchers interested in assessing whether the law governing the promotion and protection of foreign investment reflects sound public policy. Whether it is the lack of "checks and balances" on investor rights or more broadly the lack of balance between public rights and private interests, the time is ripe for an in-depth discussions of current challenges facing the international investment law regime. Through a survey of the evolution in IIA treaty-making and an evaluation from different perspectives, the authors take stock of developments in international investment law and analyze potential solutions to some of the criticisms that plague IIAs. The book takes a multidisciplinary approach to the subject, with expert analysis from legal, political and economic scholars. The first part of the book traces the evolution of IIA treaty-making whilst the other three parts are organised around the concepts of efficiency, legitimacy and sustainability. Each contributor analyzes one or more issues related to substance, treaty negotiation, or dispute resolution, with the ultimate aim of improving IIA treaty-making in these respects. 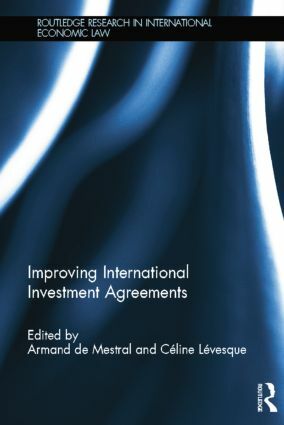 Improving International Investment Agreements will be of particular interest to students and academics in the fields of International Investment Law, International Trade Law, Business and Economics. Armand de Mestral is a specialist in international trade and investment law and comparative federalism. Teaching at McGill Faculty of Law since 1976, Professor de Mestral is also an arbitrator and panelist for the WTO, CUFTA, NAFTA, international commercial arbitration. He is co-author of International Law and The Canadian Law and Practice of International Trade. Céline Lévesque is Associate Professor at the Faculty of Law, Civil Law Section, of the University of Ottawa. Her research focuses on international investment law. In 2008-2009, she was a Scholar-in-Residence at the Trade Law Bureau of Foreign Affairs and International Trade Canada.